Methadone is a synthetic opioid. It is prescribed to dependent users of heroin and other opioids as a substitute for these drugs. In methadone maintenance treatment programs, methadone usually comes as a syrup that patients drink with fruit juice or cordial. Methadone is sometimes available in powder or tablet form. Methadone can be injected. 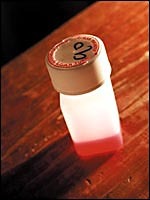 Some users illicitly "divert" methadone from treatment programs and inject it, or sell it to others for this purpose. If an excessively low dose of methadone is prescribed, effects similar to those of heroin withdrawal may be experienced (that is, flu-like symptoms, nausea, diarrhoea, aches, irritability and insomnia). On the contrary, an excessively high dose can cause similar effects to those associated with long-term heroin use (for example, drowsiness, nausea, dizziness, shallow breathing, low body temperature, slow pulse, heart palpitations). Methadone can only be legally obtained by prescription from a doctor who is a registered methadone prescriber. Injecting methadone, taking more than one dose at a time, or supplying one's methadone to someone else is illegal. Stiff penalties apply to illicit possession or supply of methadone and to illicit prescription of methadone. Foy, Done, junk, jungle juice, meth, metho.